RC North in Mazar-e-Sharif February 24, 2011. From left to right: U.S. 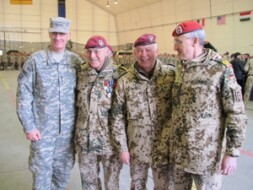 Lieutenant General David Rodriguez (Commander of ISAF Joint Command), departing RC North Commander Major General Hans-Werner Fritz, Lieutenant General Rainer Glatz (Commander German Forces Command Potsdam), and new RC North Commander Major General Markus Kneip. Lieutenant General Rainer Glatz, Commander of the Bundeswehr Operations Command in Potsdam since April 22, 2009, is responsible for all German forces operations outside Germany and the highest commander of the 5.000 Germans fighting within ISAF in Afghanistan. For the last ten years he has been involved in the military situation at the Hindukush, from 2002 to 2006 as the Commander of the Special Operations Division in Regensburg and from 2006 to 2009 as Deputy Commander Bundeswehr Operations Command. He is the German general with the most experience in Afghanistan. The World Security Network Foundation asked him about the involvement of the German forces and progress in Afghanistan in his headquarters in Potsdam near Berlin. Major General Hans-Werner Fritz commanded the Regional Command North of ISAF in Mazar-e-Sharif with 10.000 soldiers from 17 nations until February 24, 2010. The World Security Network met him in his headquarters in Camp Marmal and asked him about progress in Northern Afghanistan. Both German generals provide a good inside view of the progress of ISAF in Afghanistan and the tasks ahead. They are 'cautiously optimistic' and see 2011 as the 'year of decision' in Afghanistan due to the promising progress achieved by ISAF and the Afghan National Forces with their new strategy during the last couple of months.